the port (Jávea Puerto); and the beautiful white-sand Arenal Beach (below). Given the size of the site, there isn’t the range of activities and excursions on offer that you might expect at, say, Encosta Cabo Girão, Henllys, or La Reserva de Biniorella; these two palatial Costa Blanca properties are geared towards serious relaxation. Nonetheless, this being Spain there are fiestas aplenty for those as wants them, all just a short walk away. February is Carnival time (below) – not, as you might suppose, a celebration whose origins go way back; the Jávea Carnival first took place as recently as the 1980s. Nonetheless, the event has become very popular with children and adults alike; kids take centre stage during the daytime, while come evening it’s the grown-ups’ turn to play. 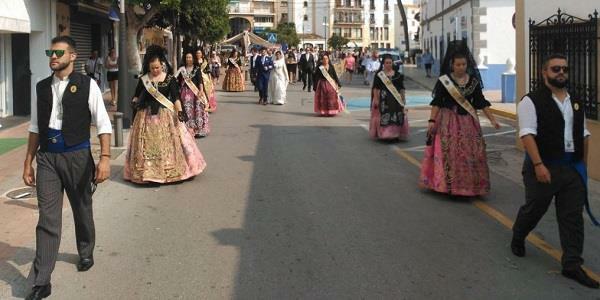 The week after Carnival, there is the ceremony of the traditional Burial of the Sardine (“Entierro de la Sardina”). A sardine is symbolically burned (as well as buried) in this celebration, to atone for any excesses that might have taken place during the Carnival itself. Which makes the latter sound much more bacchanalian than I’m sure is the case! Fire is a symbol in many Mediterranean traditions of regeneration and purification, depositing all the evil in the ashes. 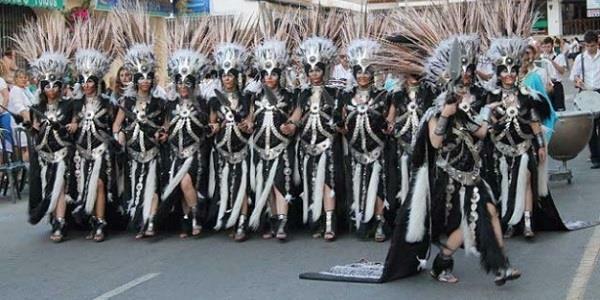 Towards the end of summer, the fiesta of Nuestra Senora de Loreto takes place from late August through to early September. However, Jáveans clearly can’t wait that long to honour their ‘patron saint’ – so they shoe-horn in a half-year celebration as well. The ‘Mig-Any Virgen de Loreto’ festival (above) is a special day in March; hundreds of people gather together every year for music, games and general revelry. 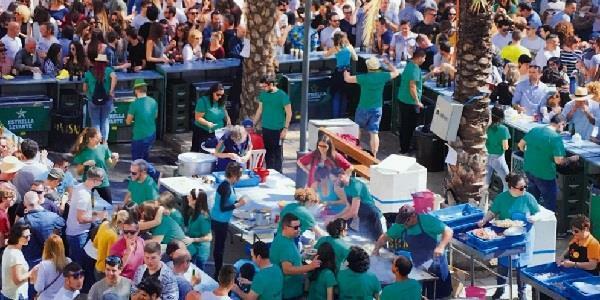 Taking place in June, Jávea’s International Festival is, in ‘World Stage’ terms, the town’s most important event. Dating back 20 years or more, this multicultural festival takes place on the Via Augusta Jávea, near the sea and offering a magnificent view of the Montgó mountain. Over three days, the International Festival is a great opportunity to sample the food, culture and traditions of 20 nations from around the world, and to enjoy music, dancing and other events. As is well known, much of Spain was for centuries under Moorish rule. 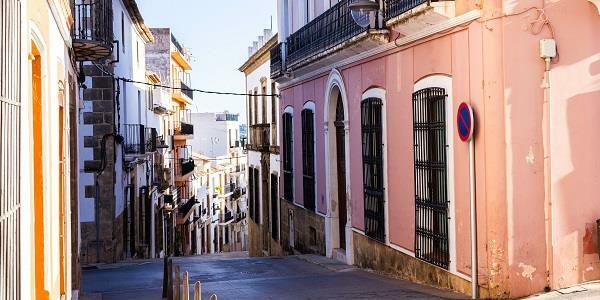 The country has the Moors to thank for many of its more impressive edifices – the mighty Alhambra, Almería city’s Alcazabar fortress, and so on – and, indeed, the prevalence of ‘Al’ as a prefix on so many place names across the Iberian Peninsula. Alicante, the Algarve, etc. But the Moors were finally despatched by the Christians in the early 17th Century – and their passing is marked (in a light-hearted way) by the Jávea Moors & Christians Fiesta (above) every July. 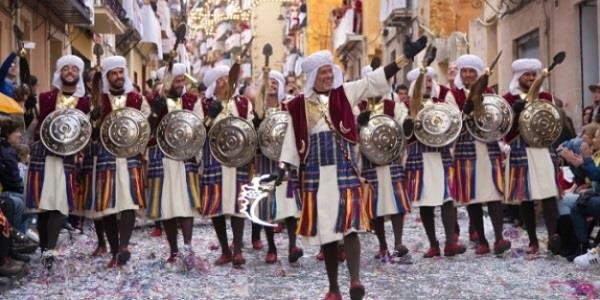 An unmissable summer treat for locals and tourists alike, the fiesta includes parades of the Moors and Christians, mock battles, and late-night partying. Then in August and September, it’s the big one, the Fiesta de la Mare de Déu de Loreto (above), AKA the Fiesta de Nuestra Señora de Loreto, Jávea’s ‘patron saint’ of the sea. 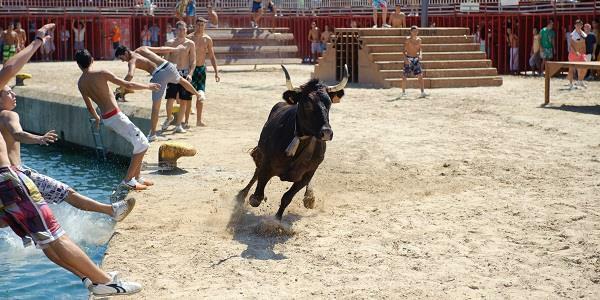 For over two weeks there’s a packed calendar of events, including parades, street parties, concerts, contests and – this being Spain – bulls. You’ll be pleased to know that in ‘Bous a la Mar’ the bovines have the upper hand (or hoof), their job being merely to chase the town’s (not-so-)intrepid youth into the briny (see below). The whole shindig ends with a Mass, a solemn procession to honour the ‘Lady of Loreto’, and a firework display.